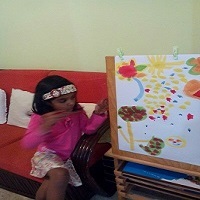 Jigyasa has 4 activities in the evenings for children aged between 3 and 8. These activity classes are carefully crafted to provide a blend of learning and fun. You are welcome to choose as many activities as you want. The activity classes are held between 4 pm and 5 pm from Tuesday to Friday. See below for details of the classes offered. 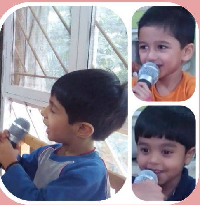 Evening activities at Jigyasa are the perfect way to keep your child constructively occupied during the evenings. The Speech and Drama club motivates children to speak with expression and character. 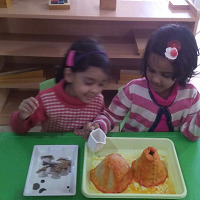 Group games and creatively thought out activities are great fun and gradually make the children confident speakers. 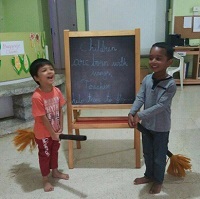 On Wednesdays, children are given ample opportunity to explore their creative side. Drawing, painting, craft and clay modeling are just some of the ways in which this class develops the future Van Goghs and Michaelangelos of the world. Cookery & Science is as it says on the tin! We make simple foods such as baked cookies, milkshakes, salads, sandwiches and smoothies - all meant to expose children to a variety of new foods. The science component introduces children to the basic physical concepts through experiments which are intriguing and fun. They say there is no difference between the man who can't read and the man who doesn't. Stories introduce children to a whole new world, giving them new ways to think about the world that they live in.